Digital menu boards for restaurants from Origin Displays represent the cutting edge in networked signage technology, allowing you to remotely update specials, promotions, pricing and menu items instantly. Working from your restaurant’s computer, you will be able to readily manage your menu board system with some of the most user friendly software available! All of our digital menu boards come with a free demo, so you will learn how to efficiently and effectively manage your content! Our digital displays are perfect for all markets! There are several digital signage companies that proclaim that they have the most user-friendly software for managing the content on your screens. We are the company that guarantees it! Other companies send salespeople who are experts on their own software, it is easy to get mesmerized during a demo. Don’t be fooled by the smoke and mirrors. 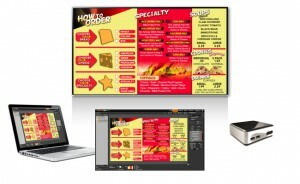 The Origin Elite digital menu board sells itself! Learn how to use in less than 15 minutes and be updating your menu digitally today! 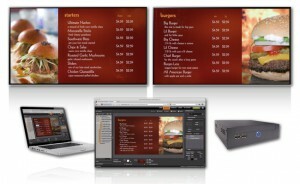 The Origin Pro digital menu board users benefit from professionally designed content that, when loaded in to the software, allows for changes to be made in live-time. Working from your restaurant’s computer, you will be able to readily manage your menu board system by controlling inventory, creating specials, and introducing new items quickly and easily! And with no on-going fees, this solution is ideal for single-unit restaurants. 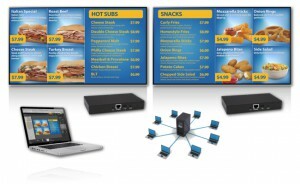 Origin Express digital menu board addresses the long outstanding need for a true single-screen digital signage solution at a reasonable price. There are no contracts and everything will arrive on site ready for use. The templates and content management tools within makes it a breeze for end users to make changes to their screen to meet your needs.